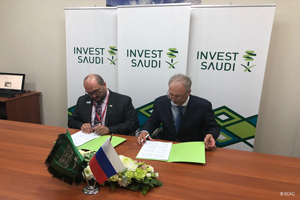 On May 25, 2018 at the St. Petersburg International Economic Forum PJSC “Irkut Corporation” and JSC “SCAC” signed Memorandum on Cooperation with Saudi Arabia State Investment Agency “SAGIA” and that will allow to provide the promotion for Russian civil aircraft at the Middle East as well as in Northern and Central Africa region. The Memorandum states the assistance of the Saudi agency as far as sales and leasing of Russian aircraft are concerned, local MC-21 and SSJ100 certification, cooperation for the after-sales support and possible perspective localization of the production, in particular the production and installation of the interior components, aircraft painting and separate construction elements manufacturing. Aiming at cooperation, the Parties agreed to hold events stimulating partnership and business and investment opportunities, information exchange and technology transfer. Source: Sukhoi Civil Aircraft Company (SCAC).